The effective dielectric permittivity method is applied, generalized and modified to determine image guide dielectric rods configurations for directional couplers with maximal bandwidth in 3–mm wavelength. 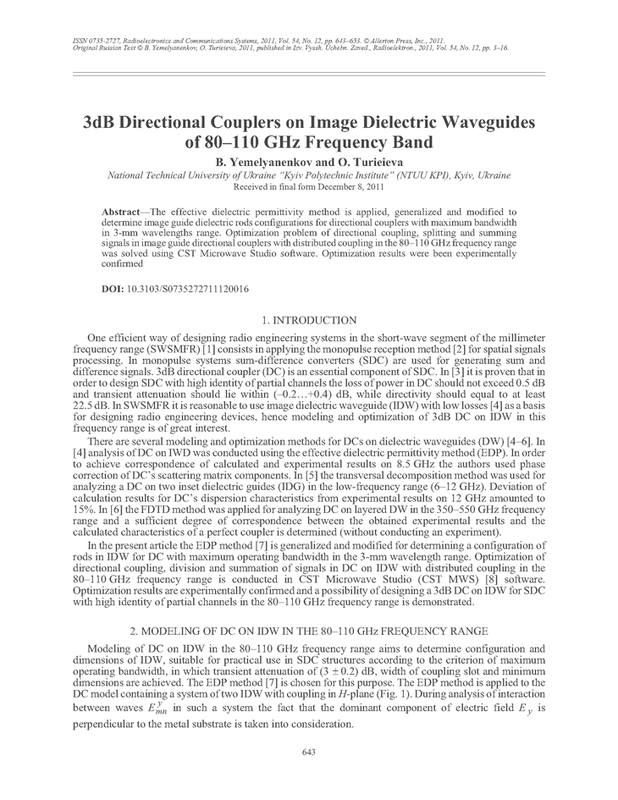 Problem of optimization of directional coupling, splitting and summing signals in image guide directional couplers with distributed coupling in frequency range of 80–110 GHz has been solved using CST Microwave Studio code. Results of optimization have been experimentally confirmed. National table of frequencies in Ukraine. Plan of using Ukrainian radio-frequency resources, Official edition, National commission on communication regulation of Ukraine. Kyiv, 2006 (in Ukraine). Ling C.C., Rebeiz G.M. A 94-GHz planar monopulse receiver. IEEE Trans. Microwave Theory Techn., 1993, vol. 3, no. 10, pp. 358-360. Drobik А.V., Yemelyanenkov B.M. Sensitivity analysis of sum-difference converter’s parameters for the millimeter band. Zvyazok, 2010, no. 4, pp. 56-63. Paul D.L., Habibi M., Castrillo J., Gelin Ph., Tontain S. Analysis of coupling in image guide technology. IEEE Trans. Microwave Theory Techn., 1992, vol. 40, no. 5, pp. 1025-1028. Pennoch S.R., Boskovic D.M., Rozzi T. Analysis of coupled inset dielectric guides under LSE and LSM polarization. IEEE Trans. Microwave Theory Techn., 1992, vol. 40, no. 5, pp. 916-924. 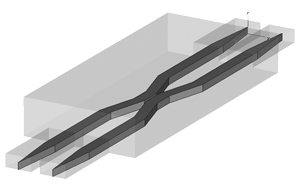 Dib N., Katehi L. Characterisation of sub-mm-wave dielectric waveguide directional coupler using FDTD method. IEEE MTT-S Int. Microwave Symp. Dig., 1994, pp. 297-300. McLevige W.V., Itoh T., Mittra R. New waveguide structures for millimeter-wave and optical integrated circuits. IEEE Trans. Microwave Theory Techn., 1975, vol. MTT–23, no. 10, pp. 788-794. CST Microwave Studio modeling software, 2010 CST Computer Simulation Technology AG. Available at: http://www.cst.com.